You can download this 8th world wonder on your computer for FREE (though, there is a version that costs money and has more advantages, but I’m on a budget here.)! In this software, you can sync it with iTunes, create playlists, share music, learn about music, connect through Facebook and Twitter, and discover music you may have originally not found. All for free. FREE. You can search popular tunes, albums, artists, to find what music suits your taste (or, in my case, how I happen to feel at one moment.) You can share the information about what you’re listening to on Facebook or Twitter, and see what other Facebook friends of yours are listening to, and instantly get that music. This is done by bringing up your friends on Fracebook in the sidebar that are using Spotify and, by clicking on their names, you can see the playlists that they have made public. These playlists can be anything from a variety of artists that they handpicked for a playlist, or simply one artist. When you click on a person’s name it also shows their top artists and top tracks. For free. In the few hours that I’ve had it and managed to experiment with it, I’ve expanded my original iTunes catalog of about 7500 by over 1,000 songs. Seriously. 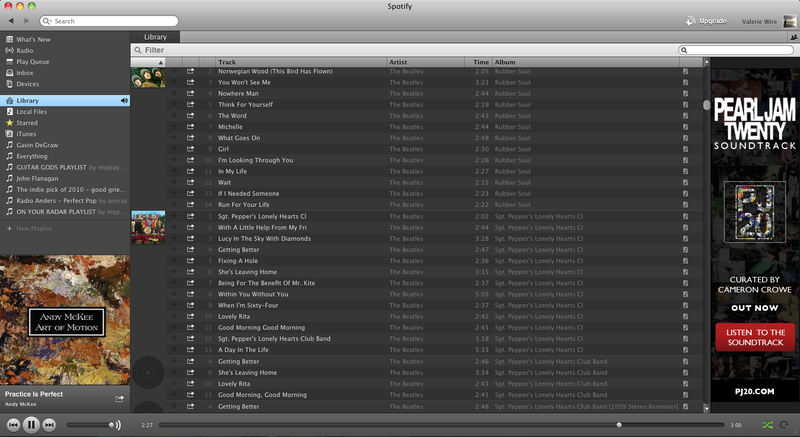 Regardless, I’m just thrilled to have this piece of technology at my fingertips. The only downfall that I’ve noted so far is that it is not accessible when you are offline. However, with today’s technology, it’s near impossible to find a place out of range of WiFi (unless you attend Belmont University and live in their apartments…). Another downfall, I guess, is that there are advertisements that pop up on sidebars and after ever few songs. But, if that’s the biggest complaint, then I’m a happy camper. Here’s a few screen shots of what it looks like! 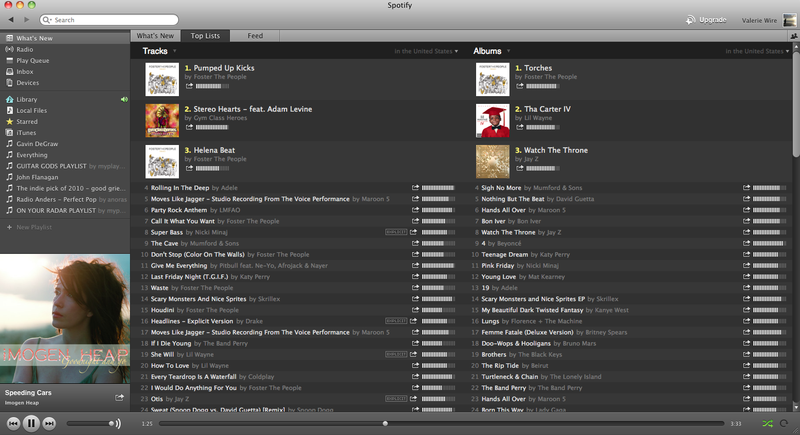 This is the “Whats New” tab… By clicking this, you see what’s hot on Spotify right now, and what’s new. 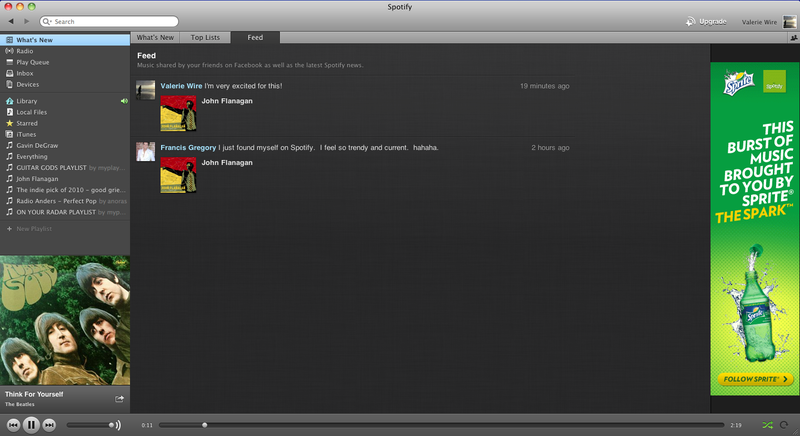 On the right, those are my list of friends from Facebook that are using Spotify! On the bottom left corner, you can also note the album artwork as well as the song and artist that is currently playing, with all the buttons along the bottom. Above that, you can see the place for all the playlists you can create, as well as different links for different things, such as your Queue (which I’m not sure what that is mainly used for, yet), your iTunes library, and more. The next tab after “What’s New” is “Top Lists” which shows top tracks, artists and albums! Note: I clicked the tiny, little icon of people in the top right hand corner to make my friend list disappear. 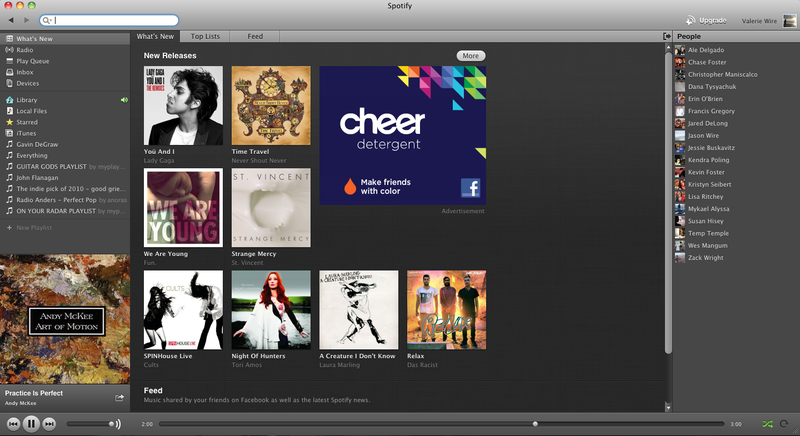 This image is of the next tab, “Feed.” This shows what other friends who use Spotify have said, as well as myself! Here’s also an example of an advertisement that popped up. 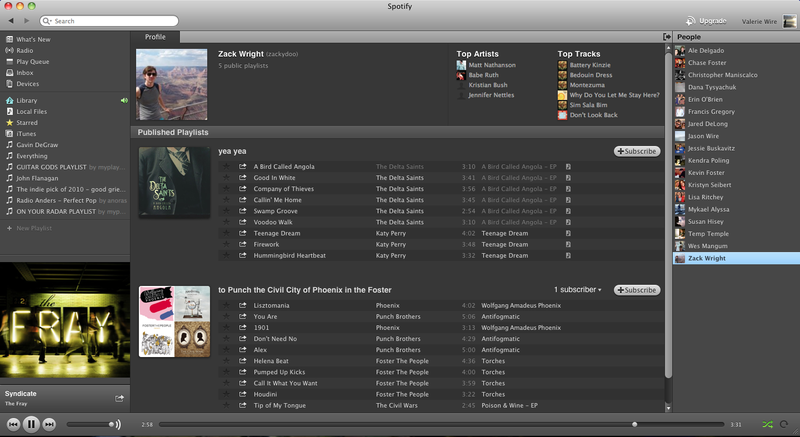 And this image shows what the library looks like, very similar to iTunes and most other music software. So, if you happen to have a love for music and collecting all that you can, it might be worth the adventure. Plus, the good thing about technology like this is, if you don’t like it, it’s as simple as 1-2-3-DELETE to get rid of. So, go ahead, give it a try. And let me know what you’re listening to! Why not? Did I mention it’s free? Next Post → Does the Kindle Fire strike a match or strike out?